JUICEBLENDZ Sports Supplement & Smoothie franchise business opportunity. Free JUICEBLENDZ Sports Supplement & Smoothie business franchise information. Take four parts customer service, three parts nutrition, two parts taste and a dash of moxie then blend until smooth. That's our recipe for success and what makes JUICEBLENDZ the freshest franchise opportunity available today. Our unique blendz are redefining the smoothie and nutrition industry. No longer are consumers captivated by tropical themes or the promise of nirvana on ice, they demand fresh, nutritious ingredients and delicious blendz to satisfy their healthy lifestyles. 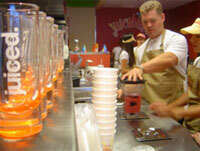 And when it comes to finding that perfect blend, JUICEBLENDZ delivers. Try any one of our delicious blendz and you'll taste and feel the difference. Each one of our blendz is formulated to feed the mind, body and tastebudz. We use only the freshest ingredients. No sugary purees, sweeteners or pre-made syrups here. Only the freshest fruits and freshly squeezed juices. In addition to our great tasting blendz, all of our locations also offer a complete line of proprietary sports supplements, vitamins and herbals. 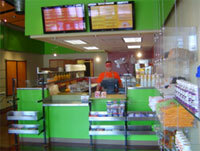 The JUICEBLENDZ Experience begins the moment you enter the store. Well stocked shelves, an interactive kiosk and a fresh, soothing palette welcomes you as you head for the juice bar located at the rear of the store. Flat screen monitors display an animated menu designed to tempt the senses. A clear view of the blending process confirms that only the finest and freshest ingredients are used. Strategically placed point of purchase displays and secondary marketing messages encourage cross selling and product upgrades. The complete JB Experience is designed to be cyclical in that it provides the customer the best possible service and the franchisee more opportunities to sell products and services. It's part of the "perfect blend" mentality that makes JUICEBLENDZ a great investment. Top Banana and founder, Adam Ogden, brings a decade of smoothie experience capitalizing on the growing 1.5 billion dollar smoothie industry. Just having a great product isn't enough…it's the JUICEBLENDZ high-energy approach to pre-opening, opening and post-opening support that quickly drives dollars to the bottom line. Single and Multi-Unit Franchises available. Start blending for fun and profits today! We are only expanding in the <?xml:namespace prefix = st1 ns = "urn:schemas-microsoft-com:office:smarttags" />Florida marketplace. To learn more about the JUICEBLENDZ Sports Supplement & Smoothie franchise opportunity, simply complete the form below.